Parthenon is a gorgeous temple built in honor of the Greek Goddess, the central construction of the Athenian acropolis. It has been proudly disposed on the main hill of the city for more than 2000 years. Within the long history of the Greek temple, it served as a church, a fortress, and a treasury. Once Parthenon temple was divided into 2 parts – the first part was a treasury, and the second one became a home of the famous statue of Athena. 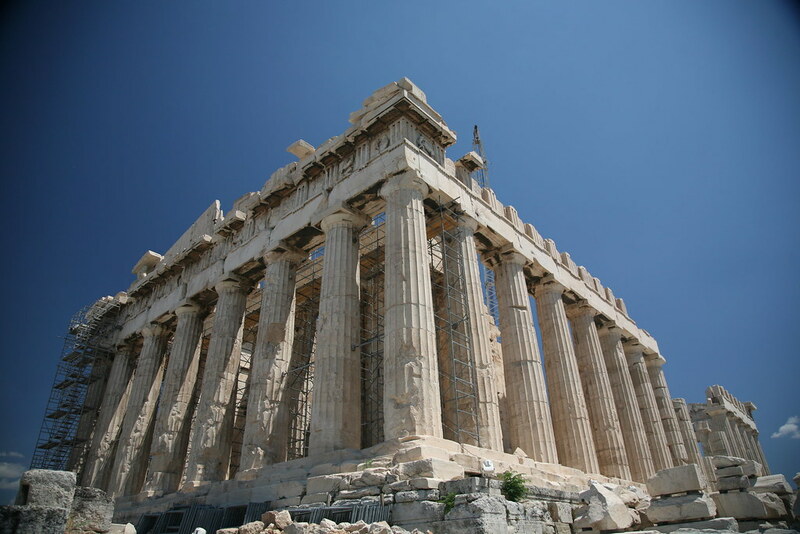 Parthenon is built in the classical style, which is very typical for the ancient Greeks. Parthenon is rectangular in shape. There are gorgeous columns at the edges of the building. The facade is decorated with scenes of single combats featuring Amazons and Greeks. Nowadays, Parthenon is visible from anywhere in Athens. The temple is especially beautiful at night due to the light of lanterns. 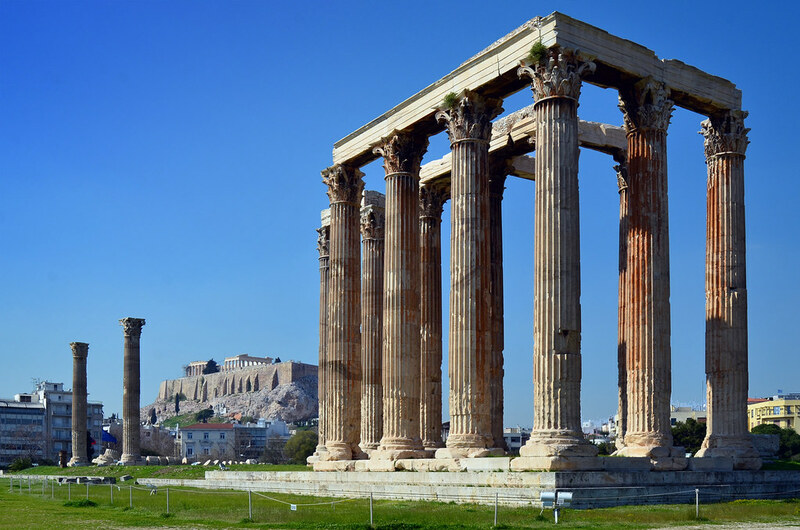 Founded in honor of the Greek god of fire, it was constructed by the order of the famous Athenian personality. It was the first building made of marble. Temple of Hephaestus is a majestic construction created in the true traditions of Greek architecture. Massive columns of the Doric order surround the building along the entire perimeter, and the impressive platform exalts the temple above the city even more pronouncedly. Numerous ornaments and sculptures give elegance and completeness to the decorations. The interior space is divided into separate sections and rooms, decorated with images of mythological creatures and events. Some sculptural paintings and statues haven’t survived till this day, but there are notations that prove their existence. 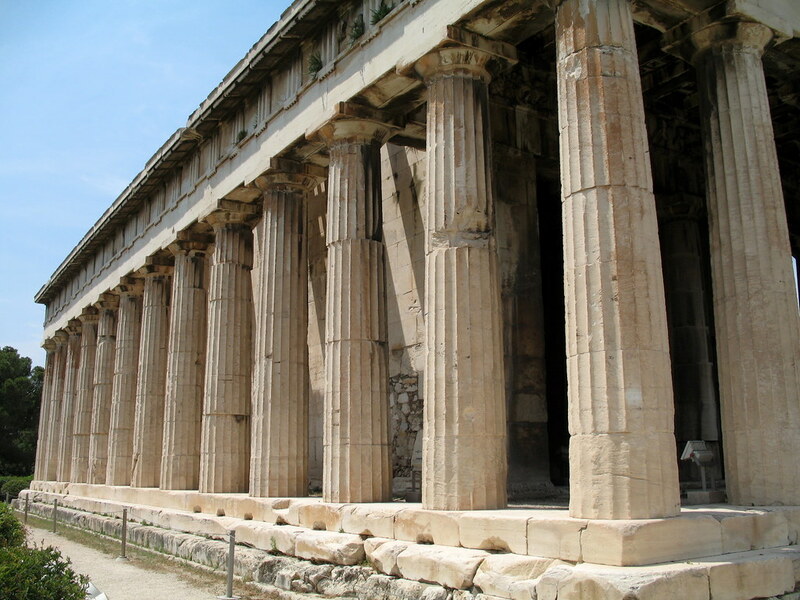 Generally, Temple of Hephaestus is a popular spot for tourist walks and educational excursions. Perhaps the walls of the building still contain a lot of undisclosed secrets. 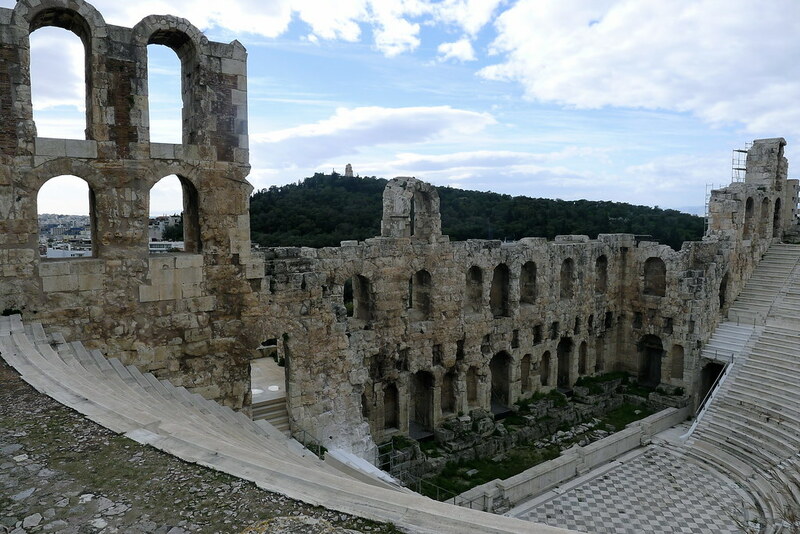 Theatre of Dionysus is an ancient theater, partially preserved to the present day. In this place, many ancient writers embodied their dramaturgic ideas, the first dramas and comedies were played, and the art of makeup and using masks was born. Any spectacle held in the theater was a truly grandiose event. Theatre of Dionysus was the center of Athenian cultural life. Today, it remains a popular place for excavations and researches. Each year, scientists discover new architectural elements and building details. Visitors can see the stage and spectator’s chairs, marble columns, statues and sculptures in detail. At the moment, significant restoration work is underway aimed at restoring and preserving the existing values. In summer, theatre festivals are organized there, which is very popular activity among locals and tourists. Temple of Zeus can rightly be called the largest Greek temple. The temple, located in the old town, is often called the Olympus. The beginning of the temple’s construction dates back to the 6th century BC, but it was completed only in the second century BC. The history of the temple became known through the texts of Pausanias – an ancient geographer and writer. He narrates that the priests began to build a sanctuary to thank Zeus, who saved local inhabitants from the flood. The construction project involved many Greek, and later Roman architects. 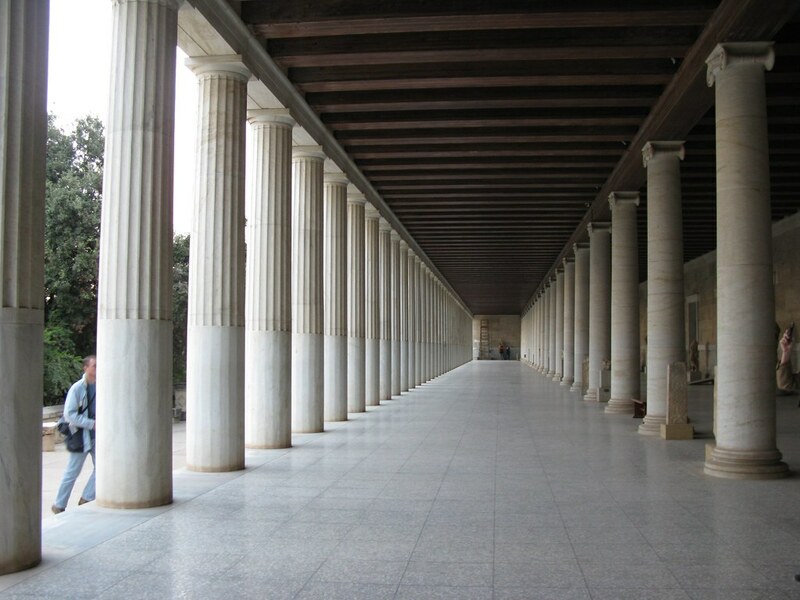 A huge rectangular construction was surrounded by columns made of marble. Previously, the width of the building reached more than 100 meters, and the diameter of the columns was almost three meters. In the center of the temple there’s a statue of Zeus, made of gold and ivory. The temple was to surpass the 7 wonders of the world. Nowadays, only about 15 columns have survived. In addition to the enormous columns, you can see there the remains of the Roman baths, basilicas and some ruins of the ancient buildings. Agora, which means the city square, was the center of life of the Ancient Athenians. Agora is situated near the Acropolis, at its northern part. This square has a rich history, because historians believe that originally this place was used in the Neolithic age, and only in the 6th century BC Agora turned into the heart of the city. At the time of Ancient Greece, the square was used for staging performances, theaters, commerce, rallies, gatherings and even sacrifices. Also, there’s another building, where King Attalus used to live. Scientists refer the building to the second century BC, but despite this, it’s well preserved. Today, there’s a museum. Unfortunately, you can see only the remains of the construction: foundations, ruins and some colonnades. Athens is an excellent spot to relax studying ancient architectural constructions. So, if your target is Greek historical monuments, get ready for a trip to Athens! Of course, take care of Athens car rental in advance, in case you like to travel safely and comfortably.